The most important step in the sales process is often one of the most neglected. No matter how good of a salesperson you are, you have to "close the sale." Ideally, you should succeed in closing every sale using either the soft or hard approach. The choice of using a soft close versus a hard close depends on the prospect. If a prospect seems unreceptive, you use a soft close, while an eager prospect is a good candidate for a hard close. It's quite common for salespeople to panic and blurt out something like, “Would you like to think it over?” Few people will buy a product when the salesperson recommends thinking about it first. After all, the prospect will reason, if the person selling the product doesn't think I should buy it now, I should definitely wait. How you close a sale depends on the situation and the prospect. If the sales process has gone pretty well and the prospect is ready to buy, closing is just a matter of saying something like, "Given everything we discussed, Model XYZ looks like the best fit for your needs. Shall we fill out the order paperwork so you can get delivery by the end of the week?" If you haven't done quite such a good job of convincing the prospect to become a buyer, you need to make up for it during the close. One helpful tool for a tough close is implementing the closing technique. 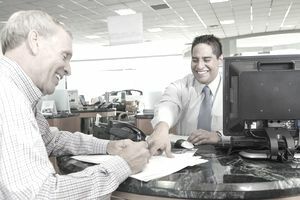 However, there are at least as many closing techniques as there are salespeople. To help you be a successful salesperson, here are a few examples of what you can do to seal the deal. It's a good idea to practice these first on friends and family so you can use them smoothly under pressure. These basic closing techniques are fairly simple to implement and will work on a wide range of prospects. If you presented the product well (and addressed the prospect's objections) but they need an extra nudge, these will do the trick. Once you've mastered the art of the basic close, you're ready to try your hand at some intermediate-level strategies. These closes aren't necessarily more difficult than the basic closing strategies, but they tend to be more complex. Closing techniques at this level can save a sale that has not gone well when you have reached the end of the sales process. These closes are a bit trickier than the basic and intermediate closes. Advanced closes require more setup time or more willingness on your part to push the prospect harder. While these take more finesse or assertiveness, when used wisely, they can seal the deal with prospects who otherwise wouldn't buy from you. Remember, closing techniques are not always necessary. They're best used when simply asking for the sale has failed. Keep in mind, closing techniques can backfire by making the prospect feel pressured or manipulated.